Down in the Florida Everglades, the Burmese python has become such a nuisance that wildlife officials will be holding a contest to see who can catch the largest snake. It’s all part of the 2016 Python Challenge announced by the Florida Wildlife Commission. Prizes up to $5,000 will be offered for the longest as well as the most pythons caught beginning Jan. 16. Not since 2013 has the agency employed such a contest as a way to combat the invasive species. The hunt that year attracted 1,600 hunters and made worldwide headlines. A total of 68 snakes were captured, the longest measuring 14 feet. In the next month, the state of Florida is offering a training course in person at several locations and on-line, which is required for participants. The training materials go over things such as how to identify the invasive python from other snakes and where to most likely spot them. 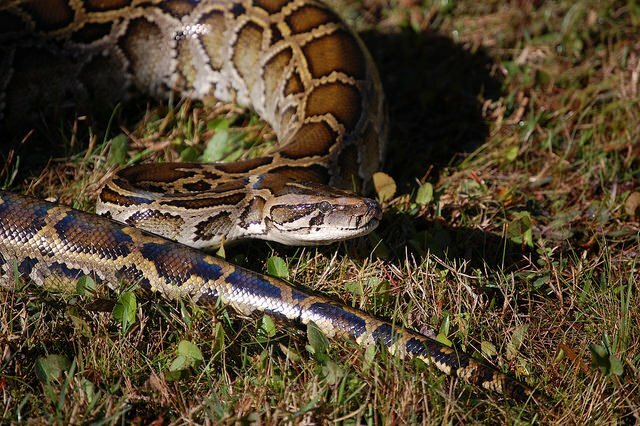 The Burmese python, which has proliferated in the Florida Everglades since the 1980s, grows to 26 feet long making it an apex predator and choking out other species. It’s also one of the most elusive snakes, making it extremely difficult to detect. Native to India, China and the Malay Peninsula, they have flourished in Florida’s humid conditions. They can be found most often during the dry winter months when they come out from their cover to find warmth. This also makes the Everglades a great place to visit during the winter. Use a hook or other tool to pull snakes onto open ground so you can see what you’re dealing with. Firmly pin the python’s neck right behind the head using the rubber handle of the hook. Get down on your knees and work on the ground. Grasp the python right behind the head, making sure you feel the jaw bones on your hand. Grab too low and it could turn its head to bite you. Be sure not to squeeze the life out it either. While continuing to hold the python reach your other hand clear to the bottom of your snake bag. This is perhaps the trickiest part. Switch hands so that your bagged hand is now holding the snake. Bringing your bagged hand underneath the python and behind its head, you can make the switch effortless. Now all you have to do is work the bag over the snake and you’re done. To take part in the 2016 Python Challenge click here.